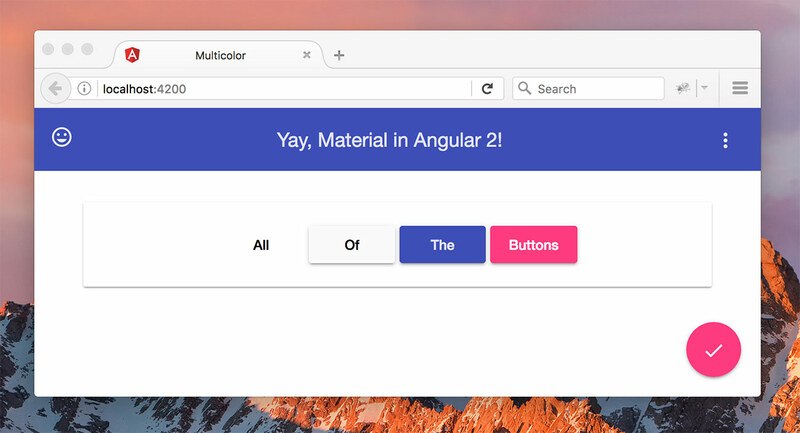 Angular Material 2 brings Material Design components to Angular 2+ apps. The goal of the project is to build a full array of components to make it very easy to built Material Design interfaces for mobile and desktop. Hammer.js is an optional dependency and helps with touch support for a few of the components. You may need to restart your local server for the changes to angular-cli.json to take effect. Prior to Angular Material 2 Beta 3, there was a global MaterialModule that could be imported in the app module to make the components available. The downside to that is that tree-shaking is not efficient enough to remove all the unused code. You’ll then import this module in the root app module. There are a few pre-built themes installed automatically with Angular Material. These set the colors and basic styling. The available themes are: indigo-pink, deeppurple-amber, purple-green and pink-bluegrey. 6. Angular Material is ready! The Angular Material 2 project: Website, Github repo. This Angular Material 2 simple app: App demo, Github repo. This Talk from Kara Erickson: Talk on Youtube, Github repo.